Max & Erma’s menu prices for a casual dining restaurant chain famous for their hand-crushed, gourmet burgers and endless seasoned fries. The menu also offers steakhouse quality steaks and chicken dishes, fresh seafood choices and delicious sandwiches. Besides Cold Beer, guests can order sangrias, margaritas, and specialty cocktails. Below are the latest Max And Erma’s menu prices. Ranch, Bleu Cheese, Signature 3rd Street, Warm Honey Mustard, Fat-Free Honey Mustard, Thousand Island, Balsamic Vinaigrette, Fire-Roasted Tomato Vinaigrette, Light Olive Oil Vinaigrette. Max & Erma’s is the ideal location to meet up with friends or co-workers after a long day on the job. Happiness Hours runs from 2:00 pm-6:00 pm and features drink and food specials. Check out your local Max & Erma’s tomorrow after work! Max & Erma’s appreciates the loyalty of regular guests. To thank loyal guests, Max & Erma’s offers the Good Neighbor Rewards(TM) loyalty program. Guests get to earn rewards on every visit. Signing up is easy and free. Sign-up online and get a free Tortilla Soup on your next visit. Rewards are tiered and based on the number of visits to the restaurant. All the details can be found on the Good Neighbor Rewards(TM) page on the official website. Max & Erma’s does not accept reservations but they offer Call Ahead Seating. Guests that know the time they plan on arriving at the restaurant can call ahead and have their name put on the waiting list. This option will definitely cut down on the wait time if any. Sometimes, it is not always easy to find time to go out for dinner as a family. Max understands. That is why Max & Erma’s offers Carryout service for guests that still want to enjoy the mouthwatering tastes of Max & Erma’s favorite dishes in the comfort of their own home. Ordering is simple and only requires guests to contact their favorite Max & Erma’s location and place their order. Not sure what to eat? Download or view the Carryout menu on the website. Once an order has been placed, guests pick it up at the agreed upon time. Making good food choices when eating at Max & Erma’s is made easier with the viewable and downloadable Nutritional Values guide. The guide lists the nutritional values of all the menu items. For guests that are looking for lower calorie options, Max & Erma’s has a selection of lighter fare menu items that are 550 calories or less. Guests with gluten sensitivities can choose from a special menu of food choices. Special menus can be viewed or downloaded online. Whether it is a fundraising event or donation, Max & Erma’s is committed to supporting the local schools, churches or other non-profit organizations in the communities in which they operate. Max & Erma’s specifically support programs that benefit children and education in the local community. Max & Erma’s fundraising efforts include a gift card or coupon donations or sponsorship. To see if Max & Erma’s will help support your organization, check out the Fundraising page on the website. 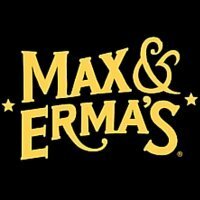 Max & Erma’s is always looking for high-energy, self-motivated individuals that are unique that enjoy working in a fun environment and are eager to provide the best possible customer service experience. Interested candidates should check out the Employment page on the official Max & Erma’s website to learn about the Max & Erma, their vision, and values and browse the list of current openings and opportunities. Todd Barnum and Barry Zacks purchased a former German tavern in Columbus, Ohio from Max and Erma Visocnik. In 1972, the two businessmen opened the first Max & Erma’s themed restaurant. Today, there are over 40 locations mainly in the Midwest and East Coast of the U.S. Glacier Restaurant Group purchased the Max & Erma’s brand in January 2016. Glacier Restaurant Group is headquartered in Whitefish, Montana. Be sure to follow and connect with Max & Erma’s through various social media platforms. For more information about Max And Erma’s, visit their official website.